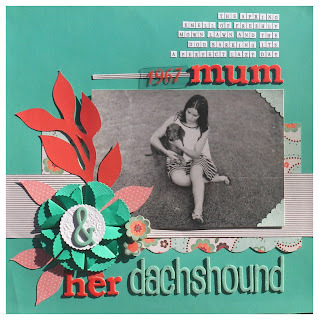 Em Stafrace| Just a Girl with Ideas: Spring has Sprung and Dachshounds! Spring has Sprung and Dachshounds! Mum with her Dachshound 1967. Spring is here, yippee...the smell of freshly mowed lawns and BBQ's and time to pull out the Magpie scarer (my tennis racket), fiesty little birds. I love spring, its the promise of summer just around the corner, its warming up and guilt free ice-creams are the perfect treat on a sunday. I have been madly scrapping and have just completed my first ATC, very exciting! I can't wait to get the girls editions and to see their designs for the theme which was Yellow and Black. 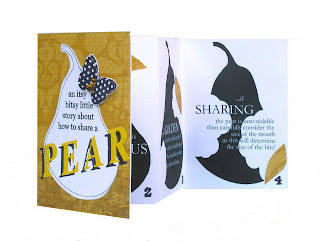 Here's my Interpretation, its a little 'Itsy Bitsy Story about how to share a Pear'. Dan has just sent off his newly updated resume to the mines and to Global Foods an International outfit that hire chefs for remote areas. The pay is in Euro, and has many benefits like risk money and annual bonuses. Not forgetting to mention its completely tax free and far surpasses the meager pay chefs get here on the coast. There is a possibility that Dan will be Chef Managing an army mess (all civilan contracted now) in Afghanistan, oooh I know scary stuff! but they are highly protected with Marine patrols and their own Gherkas. I'm a very apprehensive about the whole thing but Dan wants an 'ADVENTURE', I did suggest parachuting or bungy jumping in the Swiss Alps, but all I got was a curled lip....hmmmmmm it must be his mid life crisis! Other than that things are going well, Osky is as cute as ever although slowing down a bit now poor poppet and I have lots of drawing to do in preparation for my interview at CATC to study Graphic Design, better dust off the easel and get cracking. Wow Em...love that layout! What a gorgeous colour combo and I love the old pic! Your ATC looks fantastic too.